Ole Gunnar Solskjaer has been speaking for the first time since being appointed Manchester United manager on a permanent basis. Scroll down to read what he had to say. More from Solskjaer: "The day I walk out of the doors I hope it is with a smile on my face. I am not going to change, I will be an optimist and we will do this together." Solskjaer on the importance of qualifying for the Champions League for signing players: "The lure of Champions League is important but at Man United if you sign for five years you know you are going to be in the Champions League. "We know we are in a great position but before then we need to get going with talks about who is going to stay here." Solskjaer on whether assistant Mike Phelan will continue as part of his backroom team: "Mick is a key part of the set-up and they are talking to each other. "The set up we have now I really hope is going to continue. "It is key to getting results so I am not looking to make any changes there and they have not knocked on my door and said they don't want to be here." Asked about what his players have made of the news, Solskjaer said: "Players want to come in and do the work, play football. "We had some great chats today but most of it was about Watford. "Now the players know I am here for longer than expected. Players that get complacent never last at this club. "We are looking forward, we have got to work harder. I have got some targets, I want a Man United team to be one of the hardest working, fittest teams and that will bring results." More from Solskjaer: "I know we will be successful but it's about taking it step by step. "What I have done before as a player doesn't really bother me because I am always looking forward. "It was fantastic to work with the best manager in the world but now I am working here as the manager and I think that's a bigger achievement." Solskjaer on his targets as Man Utd manager: "To lift the Premier League trophy again is what we expect, what we're used to, what we have done so many times. "We can't wait too many years but it's not going to happen overnight. "There are so many players that have been written about that we're interested in and I'm sure when we decide what we have to do, hopefully we'll get them by pre-season." Ole Gunnar Solskjaer is being asked a lot about potential transfer targets. He wants them in before the start of pre-season, which is a trip to Perth in Western Australia. "A lot of agents have been in touch to say their players want to come here," he said. Solskjaer has just been asked how he will avoid complacency after the good start he has experienced as manager. He said: "Players who get complacent never last at this club - or managers. "The players know my expectations." More from Solskjaer: "I've had some great backing from the owners and Ed (Woodward) Communication is important. "When you work with human beings, it's so important. "The supporters have made these three months for me unbelievable. Now it's up to us to keep making progress and we have to because we're too far behind where we want to be." Click play above to watch Ole Gunnar Solskjaer's first news conference since being appointed Manchester United manager on a permanent basis. We'll continue to bring you updates. Manchester United manager Ole Gunnar Solskjaer: "It's about putting a smile on people's faces. "Whether you do that by winning games, or you go and speak to them. "It's creating an an environment everyone wants to be in, giving everyone in the club a responsibility. We were lucky that we were good and won the first few games which helped." Solskjaer says he has dreamt about this day. SMS Message: Of course OGS should be given the chance to make a success of Man Utd again after the last months. But I guess too from a PR point of view only he's putting MUFC back on the map, and with that too comes positivity in monetary and player attraction terms from Andy, Lincoln fan. More from Ole Gunnar Solskjaer: "It's not been easy the last few days because all this has been going on but my short term focus is the next two games." Have you spoken to Sir Alex Ferguson: "Yes I have but I am not going to discuss what we spoke about. It's one of the first phone calls you make when things have been decided." 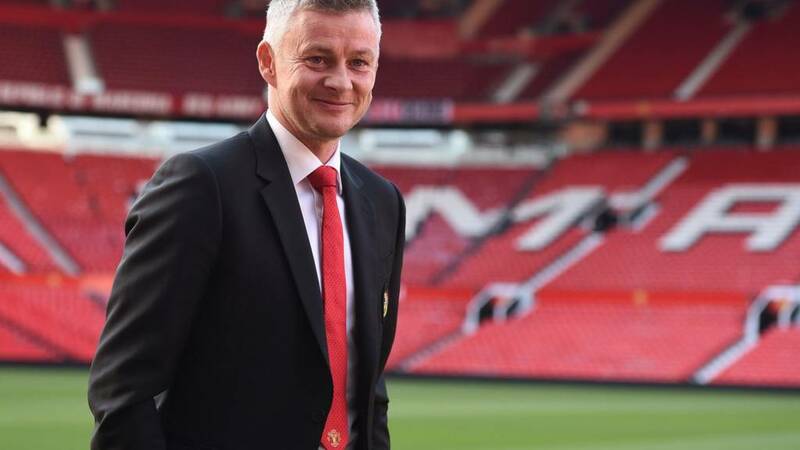 Asked if his appointment will help keep some of United's best players at the club, Solskjaer said: "To know who is the manager next season is helpful for any player. "We have a couple of players we are in talks with and hopefully we can get their futures sorted." Ole Gunnar Solskjaer is perfectly at ease on the top table. He is dressed smartly in his club suit and red tie. No wonder the Manchester United hierarchy feel he is such a good fit.